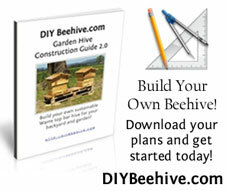 In this part of the Warre Hive Construction Guide we will look at the materials needed to build a Warre Hive. Warre hives are pretty simple to make. You only need five basic materials: wood, fasteners (like nails or screws), permeable cloth, insulating material and a finish to coat the assembled hive. Let’s take a look at the wood first. There a number of wood varieties that are good for beehives. Pine is the most popular, with cedar a close second. Softer woods like pine and cedar tend to be used more often than hard woods on account of weight. Soft woods are often less expensive as well, compared to the hard woods such as oak, or maple. According to Emile Warre in his book “Beekeeping for All,” he found that the pine seems to work well and has the added advantage of low cost. Warre also mentions that the wood thickness must be no less than 20mm(0.79″). He preferred 24mm(0.94″) for added strength in the hive box and floor. So a good wood thickness would be anywhere between 3/4 inch to 1 inch. In my hives, and in this tutorial, I have used 1″ x 12″ (callout) pine shelving. It is the same lumber size that is used in commercial ten-frame hives. Callout means that the lumber measurements are taken before the lumber is planed. Planing usually shaves off a little bit of wood. So a 1″x12″ board is closer to 3/4″x11.5″ than actually 1″x12″. You will need about 30-60 board feet of wood per hive. You will need about 30-60 feet of wood per hive, if you use a standard width of about 12 inches. To give you an idea of cost, 1″x12″ pine shelving costs around $1.24-$1.97US per board foot in the US. Also, you will need a 14″x14″ piece of thin wood like 3/8″ plywood to complete the roof. On a side note, I have recently purchased some wood which was salvaged from an old barn. It is close grain cedar and still has the red barn paint on it. It makes a nice hive box! And, I don’t have to worry about treating the exposed edges since cedar is naturally weatherproof. Nails or screws…what to use? In this construction guide, I use nails but I recommend screws. Screws work best to hold your wooden hive together. Wood naturally moves and twists as it weathers, so using screws helps to keep your hive tight. 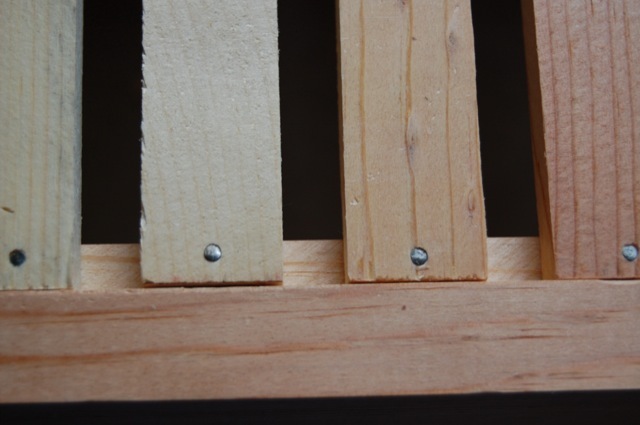 Whether you choose nails or screws, just be sure that the width of your fastener does not split your wood. If you are using 1″x12″ pine, then 6d or 7d galvanized nails or similar sized screws work well along the joints. 7d nails or similar sized screws are almost perfect to nail the end joints, but they can be hard to find. Be sure to use galvanized fasteners since they resist rust longer than bright or regular finish fasteners. You will need a few other sizes of fasteners to attach various parts of the Warre hive. As you can see in the hive box above, the handles are nailed to the side of the box. 5d galvanized nails work well for this, or similar sized screws. Also, you will need small short nails or metal pins to hold the top bars in place as you can see at right. On the next page we will look at some more materials that you will need to build a Warre Hive. Thanks so much for all the work you’ve put into these plans! I built a KTBH last year after much work synthesizing the various plans I found around on the web. My bees are still hanging in there, but for cold Montana winters I’m not sure KTBH are the way to go–too much cold box around the bees. Seems like Abbe Warre’s might be better. I’m just going to follow your plans for at least one new hive–and I’ll duly report on how it works! Thanks again. Charles – You’re very welcome. Since you are in Montana you might want to try using wood a little thicker than 3/4″. Perhaps 1″ or so. That should insulate your bees a bit more. I look forward to hearing how your Warre hive works for you! Nick, just found your site- am in Interior Alaska, and we just started talking about using Warres up here to overwinter, given package prices. ANC beeks don’t have it quite so tough as the FAI beeks. Charles, while transitioning to Warres, a windbreak of straw bales might help your girls overwinter a tad better, in addition to good stores. Hope everyone has a good season this year! Margie – Thanks for your input! That is a good idea to use straw bales as a windbreak. I did that myself one winter. I had some hives that were in the path of too much direct north wind. Hay bales did the trick! I used my house as a windbreak this winter! The sunny side of this place is the less windy side. Plus it’s fun having the gals so close. Just today I bought the wood to make at least 2 new Warre hives! Charles – Yes, using a house, barn, or shed wall is a good way to provide windbreak for your beehives. Glad to hear you are going to build some Warre Hives! What kind of wood did you choose? One hive (6 boxes, roof, skirt, floor) out of 1×10 red cedar–which was pricey ($75) but gorgeous. All the pine I could find (tried 2 lumberyards) was lousy. Also, I had an old sheet of good thick plywood that I made into a hive. I doubt that’ll last too long, but figured I’d try it–in case I can catch a swarm. In a 3rd lumberyard today I finally found great cheap 1×10 pine–so I’ll probably build another out of that. Charles – Excellent! Glad to hear you built a Warre hive! I agree, the red cedar is far superior to pine, but in many places cedar is quite expensive compared to pine. I would love to see how your Warre Hive turned out! If you want to send me some pictures of your hive, just let me know. I can even post them to the site to share with others. If the boxes are 21 cm deep (a little more than 8 1/4 inches), then why 1×12 material? 1×10 would be cheaper. Logan – I use the 1×12 because the roof end gables are taller than 10″ You need that extra width in a 1×12 board to cut an end gable and keep it in one piece. Why not “shrink” the size of the cavity by sliding in a solid wood partition making a smaller compartment that may be easier for the bees to warm ? Jeff – That is definitely an option if you have a top bar hive. Thanks for your input! Two quick questions. With the sides of the Warre TBH being vertical verses being V shaped is there more of a tendency for the bees to attach combs to the side of the hive, creating difficulty with removing the Top Bars? Also by what means are the hive boxes secured to the one above and the one below, or are they just stacked one on top of the other without any securing of the boxes to one another? What exactly is pine shelving? Is it the same thing as laminated pine? thanks for the detailed plans. i think i’ll try to build this and am hoping to be able to have a hive soon. if one is using redwood or cedar, is paint necessary? i can see spending the extra money upfront if i don’t have to paint. also, the pins/nails for the top bar, can screws also be used? or is the idea that they need to be very slim, and therefore only the pins or nails will work? thanks again, this is inspiring! Also any suggestions for transferring nucs? Can I just put the box on top, close any extra spaces and let them build down? Again, many thanks for all that you’ve done! Hi Yes I am interested in knowing how to transfer nucs, I am getting my first bees this week they will be coming on 5 national frames how do we transfer them into our warre hive??? Is it ok to use redwood in a beehive? I have heard it is best to use a food grade wood, but here in California I have heard of people building beehives with redwood. Do you know if honeybees naturally build their hives in a Redwood? Or along the West Coast, do bees naturally prefer a certain wood? I’d love to know if redwood is acceptable. We are redoing our deck and will have a bit of 2 x 6 redwood along with a few pieces of fir. Hi Wendy, yes redwood is acceptable and will weather nicely. I am interested in purchasing a Warre hive unassembled kit. Do you know of a source around Portland, OR? Raw or boiled linseed oil, having a hard time finding raw ? Hi Joe, boiled linseed isn’t what it used to be. There are chemicals added these days to make it “fast drying” that is not good for the bees. Raw is the way to go… you should be able to get raw linseed oil at your local hardware store. Last time I looked my local Home Depot carried it in the paint dept. I believe Truevalue and Ace hardware stores carry gallon jugs of raw linseed. It is best to call in first to make sure because it depends on the store. Hello! I would love to build a hive. I have looked in my shed and have a heap of one inch wood but it is about 1.5 cm short of the 21cm depth of the boxes . Would I be able to use this without effecting the bees too much or should I add the extra need to make 21cm? Thank you for such detailed plans! Hi Nicole! Glad you like the website 🙂 I don’t feel that a 21cm difference in depth will make any difference whatsoever. Plus, building them with a single piece of wood rather than 2 together will be much stronger in the long run. I was wondering if it would be a problem to use standard 1×10’s for the boxes, making them 9.5 inches deep. This would make them a lot easier for me to build. Hi Kenneth, I think that should be fine. Am I missing something here? It says that 1″x12″ are around a dollar or two? Where at? Because Ive called almost every store around here that carry 1×12’s and the cheapest I got was $17 for ONE board. And it was only a 1x12x8. I could only imagine what a 1x12x10(or 12) would cost. I would love to be able to build a Warre hive, but there is no way with the cost like that. 2×12 boards are cheaper. A year ago I went to Parr lumber and bought enough wood for a hive with $30. Forget about cedar just use pine or Douglas fir or whatever is cheapest as long as the wood is straight and you treat it with raw linseed oil (which is hard to find but possible) it will last for years. Doug Fir is on the heavy side but will last theoretically longer than pine. Good luck! hi im interested to know if i would be able to use pallet wood to build my hive box and used the raw linseed oil.I would like to repurpose things people get rid of regularly.Ive never had a hive but am very interested in starting one this year if its not to late.im in Hopkinsville Ky now but want to have the bee hive up and running in Oneida Tenn this summer.Any help or advice is so apreciated as there is so much to learn. Hi Karen, thanks for posting. I like to reuse and recycle what I can too 🙂 Dimensionally, the wood used on most pallets is only 3 1/2 inches wide so you’ll have to be creative in how you build them, creativity is the best part of recycling though…Be careful not to use any materials that have been treated with chemicals or have had chemicals spilled on them, pressure treated wood wouldn’t be good for the bees! What would change in these plans if I used 1×10’s? Could I just buy 1 1×12 for the gables etc? I bought a stack of 1×12’s and am wondering if I have wasted $ but would like to know for my next build. also, Is there a printable .doc or pdf of this build? You have done a great job and I want to share it with people! Yes, please do. I would love to see that! I will wait to build them till I see your instructions. I really am having a hard time conceptualizing them. Maybe its because these are my first hives. I will try to figure out how to use my lang entrance hives that I have. Its odd, I had two full lang hives given to me but the warre seems so much more compeling after all my research.